I just fell in love with Eve’s crocheted necklace pattern that I went home tonight and tried it. I didn’t want to make anything elaborate or with expensive yarn or beads, in case it turned out wrong, so I whipped up a little bracelet using acrylic yarn and pony beads. 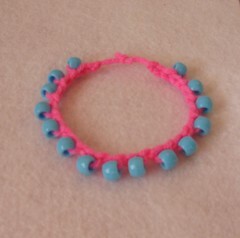 Now that I have the hang of it, minus the clasp part, I am going to give it a try with nicer yarn and beads. It was so much fun, thanks Eve! I’ve never tried bead crochet… but I think I’m getting tempted now!